Please join us for this lecture hosted by the Graduate Yoga Studies program. Free and open to the public. 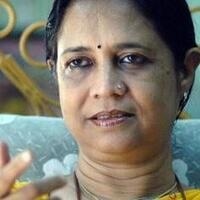 Rati Saxena is a Vedic scholar, poet, translator, editor, and Director of the Kritya Poetry Festival. Saxena received her Ph.D. in Sanskrit from the University of Rajasthan and focused her study on the Vedas, with an emphasis on the Atharvaveda. Saxena received the Kendriya Sahitya Akedemy award for translation in 2000 and has published eight collections of poetry in both English and Hindi, including one Travelodge and a critical work on the renowned Malayalam poet Balamani Amma. Her work on the Atharvaveda, entitled: The Seeds of the Mind: A Fresh Approach to the Study of Atharvaveda, was published under the Indira Gandhi National Center for Arts fellowship. Saxena is a founding member of: Asia for the World Poetry Movement - Medellin, as well as both an editor and managing trustee for the bilingual poetry web journal Kritya (www.kritya.in), through which she has organized eight national and international poetry festivals. Saxena has been invited to prestigious poetry festivals, including "PoesiaPresente" in Monza (Italy), the Mediterranean Festival, the International House of Stavanger (Norway), the Struga Poetry Evening, Macedonia, and the renown Medellin Poetry Festival in Colombia. Please see the map to the right. Turning onto LMU Drive off of Lincoln Blvd (Hwy 1), University Hall will be the first building immediately on your right. Park under the building on levels P2 or P3 (parking is free after 8 p.m. on weekdays). The elevator will take you to the ground floor ('G'). Walk straight ahead through the elevator lobby into the atrium. Take the escalator to the 3rd floor. The Theological Studies department (3700) will be behind the escalator on the LMU Drive-side of the building. The "Village" is the open seating area in the department.